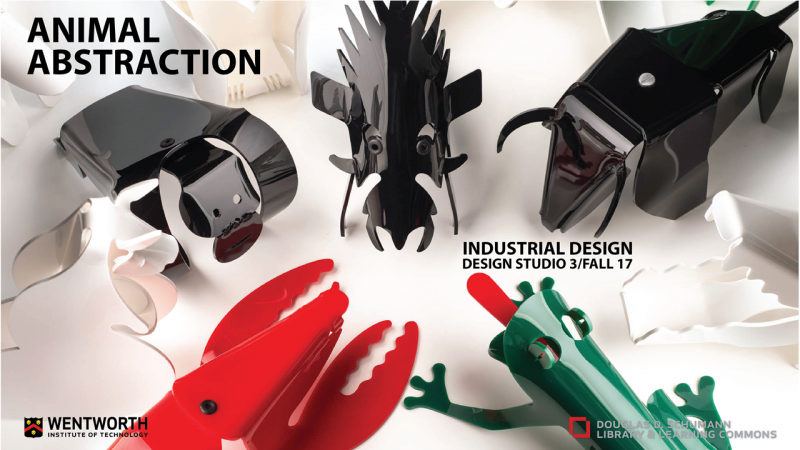 The Douglas D. Schumann Library & Learning Commons at Wentworth Institute of Technology is pleased to announce the opening of a playful exhibit titled, Animal Abstraction. Admission is free and the display will be on view January 22 – February 23, 2018. For thousands of years, artists and designers have explored the boundaries of visual representation; from abstraction (cave painting of Lascaux, Pre-Columbian Art, Picasso, Matisse, and Henry Moore) to realism (Da Vinci, Michelangelo, and Bernini). While the purpose and products of abstraction can vary greatly in the world of art and design, in this project Industrial Design students in Design Studio 3, Fall 2017, explored abstraction to clarify meaning and enhance the communication of ideas and create a sense of delight. The goal of this project was to improve the students’ skill at formal abstraction by taking a complex form and refining the shape and details to create a simplified yet clear visual statement. This studio project was inspired by the work of American Design pioneers Charles and Ray Eames, especially their famous work with bent plywood in the 1940s that originated in an innovative range of furniture and other items that are still in production today. The design prompt to create the animal abstractions in this show was the iconic bent plywood children’s stool in the shape of an elephant designed by the Eames in 1945. The stool never went to production because of technical difficulties. In 2007 the Swiss modern furniture company Vitra launched a limited edition and a few years later made it a permanent item in their collection, available in American cherry and polypropylene versions. Albrecht, Donald, Charles Eames, and Ray Eames. The Work of Charles and Ray Eames: A Legacy of Invention. New York: Harry N. Abrams in association with the Library of Congress and the Vitra Design Museum, 1997. Bordek, Bernhard E. Design: History, Theory, and Practice of Product Design. Boston, MA : Birkhauser-Publishers for Architecture, 2005. Demetrios, Eames, Gloria Fowler, and Steve Crist. Eames: Beautiful Details. Los Angeles: AMMO Books, 2012. Eames, Charles, et al. Charles and Ray Eames. Barcelona: Ediciones Polografa: Ajuntament de Barcelona, 2007. Eames, Charles, Ray Eames, and Daniel Ostroff. An Eames Anthology: Articles, Film Scripts, Interviews, Letters, Notes, Speeches. New Haven; London: Yale University Press, 2015. Hannah, Gail G. Elements of Design: Rowena Reed Kostellow and the Structure of Visual Relationships. New York: Princeton Architectural Press, 2002. Kirkham, Pat. Charles and Ray Eames: Designers of the Twentieth Century. Cambridge, Mass. : MIT Press, 1995. Neuhart, John, et al. Eames Design: The Work of the Office of Charles and Ray Eames. New York: H.N. Abrams, 1989. Ramos, Filipa. Animals. London; Cambridge, MA: Whitechapel Gallery, The MIT Press, 2016, 2016. Wong, Wucius. Principles of Three-Dimensional Design. New York: Van Nostrand Reinhold Co., 1977. For more information, please see the news story or contact libraryexhibits@wit.edu.